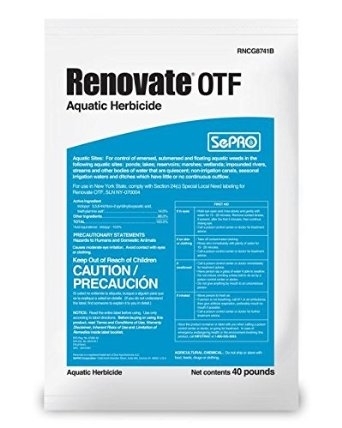 Renovate OTF Granular Aquatic Herbicide is labeled for control of submersed, emersed and floating plants in and around aquatic sites such as ponds, lakes, reservoirs, non-irrigation canals, ditches, marshes and wetlands. Renovate OTF (granular) Aquatic Herbicide is labeled for control of submersed, emersed and floating plants in and around aquatic sites such as ponds, lakes, reservoirs, non-irrigation canals, ditches, marshes and wetlands. The active ingredient in Renovate OTF—triclopyr—rapidly enters through the target plant's leaves and stems, interfering with plant metabolism, and providing systemic control of susceptible plant species. The herbicidal power of Renovate OTF impacts most dicot (broadleaf) plants, while having little to no impact on most monocots (grassy type species), providing an excellent tool for aquatic ecosystem restoration programs. The application of Renovate OTF consists of a surface application (aerial or watercraft equipment) targeting submersed, emersed and floating plants. Renovate OTF is the triclopyr product of choice to improve efficacy and cost when conducting spot applications (docks, marinas), partial lake applications (shoreline, coves, bays) and sites with a high dilution potential (i.e. Eurasian watermilfoil control in deep water and moving water). Renovate OTF carries no restrictions on recreational use such as swimming and fishing, or on livestock consumption of water from the treatment area. 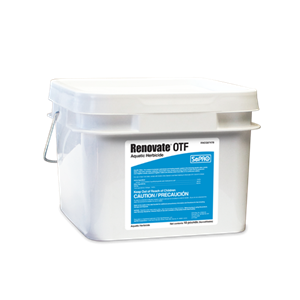 Renovate OTF can be used near active potable water intakes. Please see labels for specific precautions.